Laughing sesame balls 笑 口 棗 means Laughing Dates as they cracked open once they hit the oil like a wide laughing mouth. They carry the meaning of bringing and spreading laughter and happiness to all families. These little crunchers are coated with sesame seeds, crispy on the outside and slightly chewy with a good crunch on the inside. These sesame balls are so popular nowadays that they are eaten all year round. A favourite of many in Hong Kong and including myself! You know the origins can be traced back to the Tang dynasty as a palace food in Chang’an so If it`s good enough for the Emperor its good enough for me. 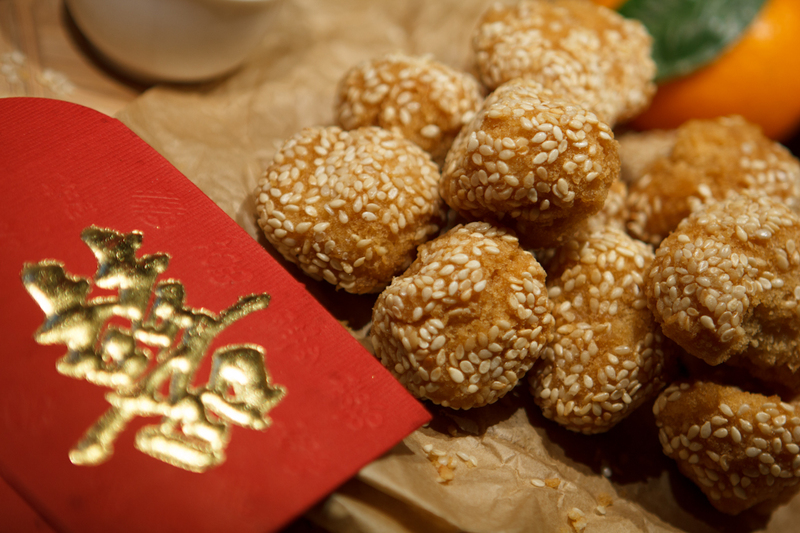 During Chinese New Year, families would make snacks/desserts when they visit each other to Bai neen 拜年 bringing them the symbolize meaning and good will. Chinese people eat a lot of sugary desserts during the New Year as sweetness in foods usually symbolises a sweet life ahead and blessing for the future. • To form the dough sift the flour and baking powder into a mixing bowl. Add in sugar, coconut oil, water and a beaten egg. Cover and rest the dough for 20 minutes. • Divide the dough into 25 portions, roll each portion into a round, ball. Brush water on balls and roll into a bowl of sesame seeds. • Pre-heat oil in a wok, shallow pot or a deep fryer on a medium heat. Place 6 balls into the hot oil and fry for 10 seconds till the balls float to the surface. Fry for 1 ½ -2 minutes. Turn the balls over after a minute to ensure each side are fried to a golden brown colour. The balls should crack. • Drain sesame balls onto kitchen paper to remove excess oil. Ensure sesame balls are cool before eating. Oh my! So delicious 🙂 I’m lazy though, don’t like deep-frying. Lucky for me not everyone is as lazy as me. This is one of my favourite guilty pleasures.. to be honest, I love most fried things that are sprinkled with sesame seed 🙂 I’m going to file this recipe away on Pinterest in case I wake up enthusiastic about deep-frying one day and not lazy….